Being one of the best organization, we have carved a niche for ourselves in this domain by trading and supplying PVC Supported Hand Gloves. - Used for application requiring protection from oil and other liquids. We offer a wide range of Rubber (PVC) hand gloves which are specially designed to meet the exacting requirements of the clients. Our quality gloves are available in variety of sizes, designs and styles for different applications. 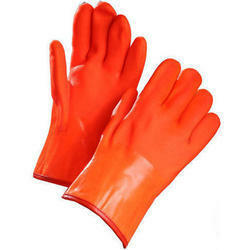 We offer a wide range of PVC Rubber Hand Gloves 14" which are specially designed to meet the exacting requirements of the clients. Our quality gloves are available in variety of sizes, designs and styles for different applications. - Size: 12 , 14, 16, 18, 22 Inches. - 60 Gauge 100 piece pack, single piece per pack. Our wide range includes Plastic Disposable Veterinary Gloves that are made from high quality plastic. 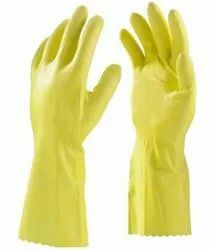 Available in free size as well as customized size, these veterinary gloves are known for their high strength, greater sensitivity, good barrier properties and safety & hygienic properties.